“Sometimes, life doesn’t end up as what we planned. Because it is meant to be better”. In 1970, Wally started baking chocolate chip cookies for his friends using a recipe and procedure that had been passed down from his Aunt Delia. For five years he gave away every batch he made, even though people often told him that his cookies were so good that he should go into business and sell them. Wally had other ideas though. He was determined to become a big time show – business manager. Then one day a friends, B.J. Gilmore, told him that she had a friend who could put up the money for a cookie – making business. Her friend never made the investment, but Wally got some of his own friends – including Jeff Wall, Helen Reddy, and Marvin Gaye – to put up some money. Then Wally was off and running. Originally, he intended to open up only one store on, Sunset Boulevard, just enough to“make a living.” After all, his was the only store in the world dedicated to the sale of nothing but chocolate chip cookies. But business grew virtually overnight. 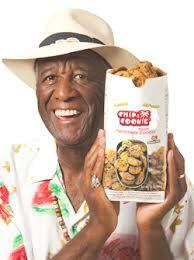 Wally’s “Famous Amos Chocolate Chip Cookies” were soon distributed worldwide. Wally himself became a spokesman for other products, from eggs to airlines to a telephone company. While he once dreamed of managing stars, he now is one in his own right! Sometimes dreams come through the back door. Kept it unlocked!